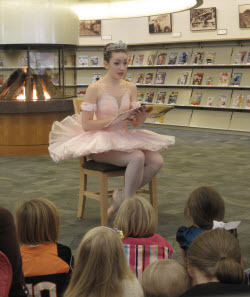 NW Dance Theatre will make a special appearance at the Tualatin Library with excerpts from A Nutcracker Tea, a family-friendly adaptation of the Nutcracker ballet. The performance will be held at the Tualatin Public Library on Saturday, December 3 at noon. The Sugar Plum Fairy dressed in her tutu and tiara will be reading the Nutcracker story. Following the story some of the dancers will perform excerpts from the Nutcracker for the audience.